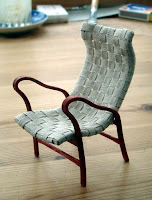 I’m in love with these 1:10 and 1:12 miniature modern chairs from Kotte Toys of Sweden. 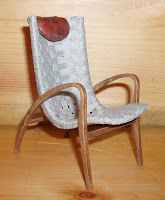 It appears that this company has a miniature chair club where you get a set of chairs for 870 – 960 Swedish Krona (SEK) which translates to roughly $136 - $150 dollars. Unfortunately for me, the entire site is in Swedish despite having “English pages”. I’ve contacted them to find out more about their lovely chairs and will post more detail if they respond. "Today most of my chair builders are from the Nordic countries. Because of that I have not worked so much with my English pages. But I think you can look around and see the chairs also in the Swedish pages. I use to do my chairs first for a museum and their museum shop so most of the chairs you can find in Swedish museums. Some of my chair club members are people interested in furniture old and new. Some of the people like to do their chairs as like the original as they can. Kotte toys are a one man company, and I have done one new chair every month since year 2000.
today there are about 80 chairs in my catalog. Now I am also making some experiments to make houses in the same way as the chairs (1:12). The chairs are done with water jet. Small water jet 0,1 mm cutting the parts of the chairs with very high pressure 4000 Bar. I do CAD-drawings for the chairs, and they will be cut out in aeroplane plywood. So the chairs are a little puzzle a building kit. They call me mini IKEA. Because a deliver a flat package, and you have to build it together yourself. I can deliver my chairs in a ordinary letter. If you become chair club member you will become all new chairs I am making. All old chairs you can order from me. Today I have no real web shop. But you can send me a E-mail and order chairs. 100 SEK is = 16 Dollar"